One country plus one composer plus one classical bayanist add up to a unique experience. 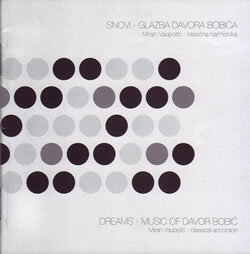 In "Dreams", Croation bayanist Miran Vaupotic presents to us his virtuoso rendition of the works of Croation composer Davor Bobic . Miran Vaupotic was born in 1982 in Zagreb, Croatia. He studied at the Ino Mirkovich Music Academy under license of Moscow State Conservatory P.I. Tchaikovsky in Lovran and Faculty of Arts in Pula graduating in 2005. Davor Bobic (b. 1968, Varazdin) is a celebrated Croatian composer whose works include compositions for solo instruments as well as symphonies. These four suites offer us an aural perspective of childhood. Each of the 25 pieces are brief and thus provide an authentic rendition of the interior world of the child which changes quickly from one mood to another and from one interest to another. The opening selection, A Game of Hide and Seek, is the longest piece lasting only 2:37. The initial 3 note motif (C, Bb,F [major 2nd down, perfect 4th down]) is quickly established and then playfully hidden within supporting motifs. The opening motif is finally found in the last 4 notes of the piece. Suite No.1 ends with First Love, a wonderfully reflective piece that captures the awe and mystery of a child's first glimpse of 'the other'. Suite No.2 begins with a piece that can only be truly rendered on the accordion. The Shenanigans include searing cluster glissandos and puncuated bellow technique. Vaupotic does a wonderful job bringing the shenanigans to life. The Roller Organ stands in stark contrast to the previous selection. It is a delightfully simple waltz with a short surprise ending. The most intricate and complicated piece of the second collection is Site of the Forest Faires. It opens with a shimmering passage based on tritones (augmented 4th interval) and then uses frentic tritoned bellow shakes followed by trills in the treble and melody in the low end of the bass to create an atmosphere of anticipation. In this composition Bobic effectively uses the traditional sense of the tritone as forboding and dangerous--the forbidden interval. Varazdin Winter Morning, the third selection of the Suite No. 3 offers us a piece with a distinctive Eastern European 'flavor'. Perhaps this is as it should be since Varazdin is a city on the banks of the Drava river located in northwest section of Croatia. A three note continously recurring motif (perfect 4th down, minor 2nd up) in the upper treble spans the entire length of the composion. The theme alternates bewteen treble and bass creating a feeling of heaviness and darkness. Suite No. 4 begins with a short fanfare followed by a presto melody. The following two waltzes present an interesting juxtaposition. The first waltz is very traditional while the second plays and strays somewhat from the tradition. It does make me wonder if the composer was hinting in the second waltz that the child seeks to reach beyond the world given to him or her. Melody of the Nostalgic Chardash introduces us to the chardash--the traditional Hungarian folk dance (see 'chardash' entry in Wikipedia). The second longest piece on this album, Forest Apparitions is an exciting and tension filled piece. A recurring, puncutated, rhythmic chord played above the melody creates an atmosphere of urgency. The melody gives way to tone clusters, returns briefly, and then melts into clusters that give way to non-tonal percussive 'hits' on the instrument and to non-verbal voice. Of all the selections, this piece experiments the most with tonal versus the non-tonal. In contrast to Forest Apparitions, the final piece, The Turkey is a light, humorous scherzo that fixates on one motif with dynamic energy. Thus the album ends with a childlike exhuberance. I must say that I truly enjoy listening to this work. I find both the composer and the performer fascinating. The compositions take us into a world filled with frolic, mystery, apprehension, and joy. Miran Vaupotic is an able interpreter of the work of Davor Bobic.